The Show-Me Missouri State Chili Cookoff at this year’s Pike County Fair was a wonderful experience for all the chili cooks who participated. The weather was hot. The chili was hot, but the beer, and tea was ice cold. We only wished a lot more people would have come to experience the chilis made by chefs from Missouri, Kansas, Oklahoma, Illinois, Iowa, Wisconsin and Arkansas. 21 Red Chili, 14 Green Chili, 12 Salsa and 15 Anything Goes Chili competed for prizes and a place to cook at the world competition. Everyone cooked in the beer garden, next to the horseshoe pits and the peddle tractor pull track. Next year get out to the fair early and see a few things that go on during the day. They let you in and out of the fair all day. Bill Blakey painted and framed some original watercolor paintings for the cookoff trophies. They got a lot of attention from everyone cooking, because only a few would get to take one home. 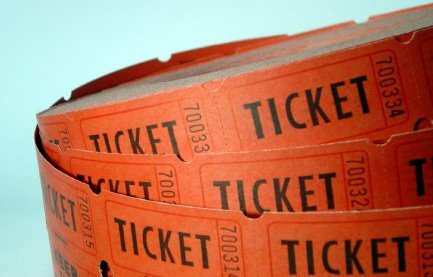 Larry and Joyce Wright from St. Charles, Missouri won the Raintree Arts Council fund raising raffle for an overnight stay at Overlook Farms at Rackheath House or Cedarcrest Manor. Thanks to all the venue, sponsors, cooks, and volunteers for making this a very successful event. Chili Cookoff: I like it Sunny and 75! It was a gorgeous weekend at the Mississippi Riverfront park in Clarksville Missouri. Saturday was a perfect day for the International Chili Society (ICS) Clarksville Missouri Regional Chili Cookoff! Chili, Music, Drinks, Chili, Dancing, Snow Cones, and more Chili! I had them all! I don’t have the list of winners with me, but I’ll get them in this post this week! Get your recipes ready for next year. You might be cooking next to me. See you next year! The Clarksville Regional Chili Cookoff is happening this weekend. The weather looks like it might be the best June 2nd we’ve seen in years! No sweltering heat. No drenching humidity. No bugs! Check out the Chili event page on facebook. There’s still time to sign up if you’d like to see if your chili has what it takes. You might even win $600 cash! We’re giving away $1200 total! We’ve got 2 bands set to play, so there will be plenty of music to go along with the beers and the chili. First up are local friends of mine: Stranger’s Almanac. I’ve seen them play the Dog Prairie Tavern in St. Paul, Missouri and I’m glad the made the bill as the opening band for the Chili Cookoff. They play modern and classic covers this Saturday 10:00 AM to 12:30 PM. After Stranger’s Almanac, St Louis’s favorite big band Everyday People will finish the day playing 1:00 PM – 4:00 PM. They will cover tunes from every era and are sure to be a hit with all ages. Don’t forget, there will also be a beer garden, Chili tasting, great prize raffles, and other food and great people. Help support the Arts, and our Sponsors! You ain’t gonna get any nouveau, amandine, thin crust, bottled water, sauteed city food. Food’s brown, hot, and plenty of it!! Clarksville Missouri Regional Chili Cookoff is happening Saturday June 2nd in Clarksville’s beautiful Mississippi Riverfront Park. It’s a good time for everyone who attends, but the cooks seem to have the most fun! For a little taste of the fun, check this video from the 2010 World Champions featuring Scott and Lauren Hunt from Bowling Green Missouri, who qualified through the Clarksville Regional Chili Cookoff! Featuring Clarksville Regional Qualifiers Scott & Lauren Hunt from Bowling Green Missouri! 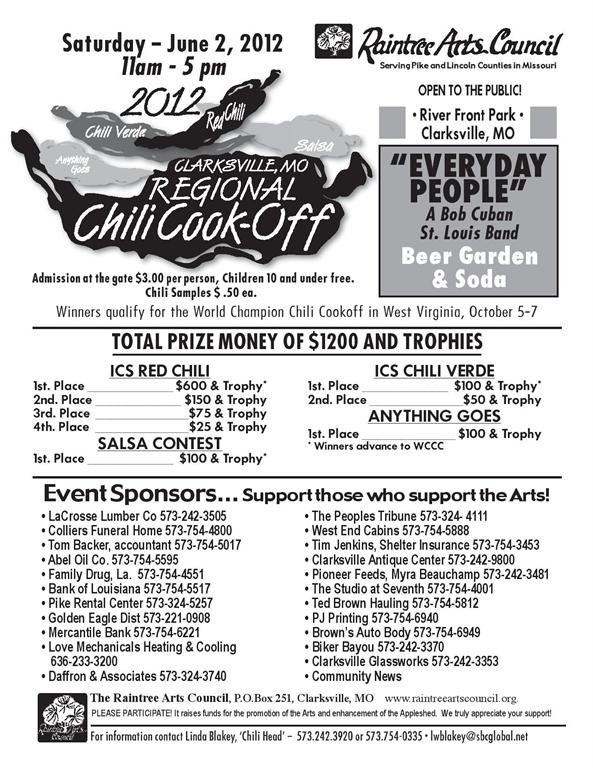 For more information, check the Clarksville Missouri Regional Chili Cookoff Facebook Page. Then check out the sponsoring Raintree Arts Council Facebook Page.